Channel 4 is to reignite controversy over the wearing of the veil - by featuring a Muslim woman in full niqab giving the broadcaster's alternative Christmas message. The woman, today named only as Khadija and said to be a lecturer in Islamic studies, will go head-to-head with the Queen when she gives her annual speech to the nation on 25 December. Producers are said to have "discovered" her after a month-long search for a suitable candidate. A spokesman for the channel added: "We felt it fitting that Channel 4's alternative Christmas message should be given by a Muslim woman in a year when issues of religious and racial identity and freedom of expression have dominated the news agenda. "Khadija has a wide range of interesting views about life as a British Muslim woman"
Khadija - who is in her early thirties and from the Midlands - caught TV bosses' attention for "being articulate, engaging and interesting". She is due to record the speech within the coming fortnight and is expected to reflect on the past year. 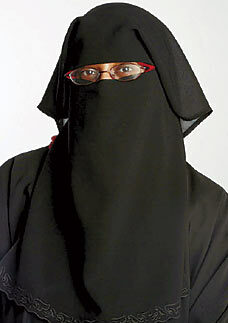 While the channel is refusing to give more specific details of her background for fear that she will be inundated with interview requests, they said she was born in Zimbabwe, is a British citizen and has been wearing the full niqab - which covers everything but the eyes - for ten years. The decision to broadcast such a contentious alternative comes after several years during which Channel 4 has screened light-hearted, jokey messages by celebrities such as Jamie Oliver and Sharon Osbourne. The last time a serious issue was tackled was in 2001, when World Trade Centre survivor Genelle Guzman gave the speech.